There is an organization called the “Coney Island Polar Bear Club” where members take a plunge into the freezing cold waters of the Atlantic Ocean in order to raise funds for local non-profits. But there is another group of people, local Yeshiva bochurim and alumni from Yeshiva Shaarei Chaim, who took a plunge of a different sort. They plunged into the near freezing waters of the Atlantic Ocean in order to help out the Vaad of Five Towns and the Sands Atlantic Beach by tovelling well over 6000 glasses. Initially, the tovelling venture was planned for 10:30 AM. However, the Yeshiva bochurim told the organizers that they were unavailable until 2:00 PM. They were all in morning seder. This is during Bein HaZmanim – when Yeshiva is not in session. The venture happened at 2:00 PM. “I am so proud that this is how our talmidim spend their Bain HaZmanim – learning a strong morning seder and then in the afternoon being mezakeh es harabbim by tovelling these glasses,” remarked Rabbi Yerachmiel Scheiner, one of the co-Roshei Yeshiva of Yeshiva Shaarei Chaim. The glasses were delivered by pickup truck from the Sands building to the beachfront in dishwasher racks. The Sands workers made four trips back and forth. The racks were covered with chicken wire so that when the racks would enter the water the glasses would not float away. 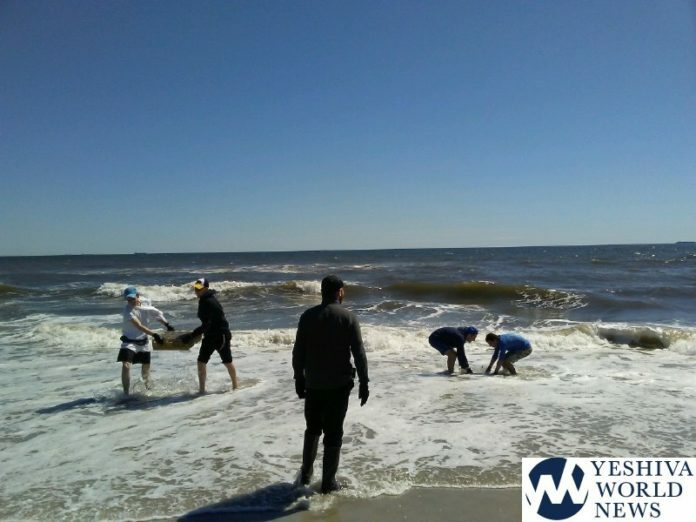 “The water was near freezing – we had to dig our feet into the sand to keep warm,” remarked one of the Shaarei Chaim alumnus. When asked, however, as to whether they would do it again – all of the yeshiva students responded affirmatively – notwithstanding the near freezing temperature of the water. The project was led by Rabbi Yossi Eisen, the head of the Vaad HaRabbonim of the Five Towns and Far Rockaway. The issue of whether dishes of Jewish catering establishments require immersion has been discussed by Poskim. Rabbi Yisroel Belsky zt”l of the OU ruled that it was necessary (See Shulchan HaLevi Vol. I p.245) and this is OU policy currently as this author understands things. Rav Ovadiah Yoseph zt”l, however, did not require establishments to immerse their dishes. The consensus of Poskim, however, do require it. But first, let’s get a general overview of the topic. The Torah (BaMidbar 31:23) tells us of the obligation of immersing metal utensils whose origin was of non-Jewish ownership or manufacture. The vessels must be immersed in a Mikvah, sea, lake or river. The Mitzvah is called Tvilas Keilim. The Mitzvah is discussed in a Mishna in the tractate of Avodah Zarah (page 75b). TEVILAS KAILIM – BIBLICAL OR RABBINIC? There is a question as to whether the requirement, in general, to immerse dishes is Biblical or Rabbinic. The issue is whether or not the verses quoted in the Talmud are to be understood literally or whether they constitute something called an Asmachta – a Biblical allusion to a future Rabbinic enactment. Some Rishonim (such as the Rambam) understand it as a Rabbinic requirement. Others (the Ritvah) believe that when the Gemorah utilizes the phrase “and we need this verse, because otherwise we might have thought etc..” it cannot be an Asmachta. The Shulchan Aruch in Yore Deah (120:9 and 14) implies that it is Biblical while in Orech Chaim (323:7) the implication is that it is Rabbinic. The Biur Halacha explores the possibility of the author of the Shulchan Aruch having changed his mind and subsequently being of the opinion that it is biblically forbidden. The practical halachic difference as to whether it is biblical or Rabbinic is when a doubt arises. Also, in a situation where a child was the one who dipped the vessel – he is believed if the obligation is only Rabbinical but not on one where the obligation is from the Torah. MAY ONE EAT FROM UNTOVELLED DISHES? There is actually a debate as to whether it is forbidden to eat or drink from vessels that were not tovelled and are owned by a Jew. The Ramah (YD 120:8) writes that it is forbidden to use a vessel that was not immersed even once. The Chazon Ish (cited in Teshuvos v’Hanhagos Vol. I 356) also forbids it. It is also clear from Rav Moshe Feinstein’s responsa (Igros Moshe YD Vol. III #22) that it is forbidden to use such vessels. Rav Feinstein writes, however, that if the food item is a solid and can technically be eaten even without the plate or bowl – then it would be permitted. It is reported that Rav Elyashiv (Kuntrus Tvilas Keilim) was of the same view as Rav Feinstein in this matter. Rav Shlomo Zalman Auerbach zt”l (Minchas Shlomo Vol. II #68) cites a Shach (YD 120:24) from which he derives that it would be permitted, when faced with no other choice, to use the untovelled vessels. Dayan Weiss (Minchas Yitzchok Vol. I #44) is also lenient. Even, according to these views, however, it is unclear whether it is still permitted if plastic cups are available. In other words, it could be that Rav Shlomo Zalman Auerbach’s proof from the Shach is only applicable when there is no other choice, but if it can be poured into a plastic cup at the outset – it could be that the leniency does not apply. There is another leniency that is cited by the Munkatcher Rebbe in his Darchei Teshuvah (YD 120:13, 70). He writes that it is possible that these vessels, which are not used by the owner himself, are to be considered part of his “business tools” and would not require immersion. Most Poskim, however, have rejected this leniency. All stickers should be removed from what is being immersed. This is true of rust as well (See Kitzur Shulchan Aruch 37:10). The entire vessel should be immersed simultaneously. If the vessel also needs to be koshered, the Shulchan Aruch rules that the koshering should happen first and then the immersion (See Shulchan Aruch 121:2). The OU is one of the leading Kashruth agencies in the country and is relied upon by the vast majority of observant Jews. It is always a good thing, when possible, to adopt the standards of the OU and this is a very welcome move. Tvilas Keilim is an important area of Torah and halacha that should not be relegated to second tier status. The question is how do we ensure that all the glasses, even newly purchased ones, be constantly tovelled? Although a system has apparently been put in place by the Vaad to ensure that glass purchases be done only at certain specific times – it is difficult to ensure such compliance. Most businesses make purchases on an as-needed basis rather than at specific intervals. True, a system can be arranged where purchase orders are examined by a Mashgiach, but this is hardly a foolproof system. It is this author’s view that a different set of glasses be purchased, immersed, and place under lock and key of the Hashgacha. The different set of glasses should be easily discerned from the standard glasses. It could, for example, have a red line on the bottom or a distinctive red spiral around the glass to ensure that they not get confused. The Talmud (Brachos 55a) tells us, “during the time that the Beis HaMikdash existed the mizbeach would atone for people. Now, however when the Beis HaMikdash no longer exists, it is the table of a person that brings atonement.” This refers to a table where all the food is kosher and all the keilim are pure and free of any tumah. The Sands is a commercial establishment which profits from using these cups. I hope that in addition to the mitzvah, they also received some financial compensation. Kudos to those willing to freeze to do a mitzvah. However, it appears that many of those glasses remain un-toiveled. A keili needs to be immersed in water completely. Having a wave wash over a rack for a second or two is not enough – it’s likely that many/most of those glasses did not get submerged completely in water. I recall there is a gemarah in mesechtas niddah or temurah which discusses tevila via a wave such as this. If anyone is familiar with the gemarah and can elaborate here, that would be great. agav, kudos to the chashuva bachrim! Hey Editor: The Gateshead Rov shlita (and his predecessor z”l) are both in that minority and that’s good enough for me.